Pickup your ‘Stach Card at the door! Don’t have one yet? Get yours at the door, while they last. Donate $30 early, or $40 day of, and receive a ‘Stache Card from our sponsors who will provide you 1 drink* from each of the sponsored locations over the 2018 Mustache Ride, October 6th. One Card per participant includes your $20 required Mustache Ride donation. Your entire purchase today is a donation to the Routt County Humane Society. *All purchased cards will be available to pick up at the door of each bar we are at the day of the ride. No cards will be available to pick up at the Humane Society. It is highly suggested that you bring a copy of your receipt with you for donations made online just in case (on your phone is fine). Pick Up your Stache Card at the door! Cards will be available for sale at the door of each location! We highly suggest ordering using a computer vs your cell phone, to make things easier. All cards purchased will be available at the event and no cards will be shipped to you. If you have any issues, please email us info@ssmustacheride.com and we will get back to you. *Donated drinks are determined by each location and may include 1 beer, 1 wine, 1 well drink, or 1 soda per location. You must have the card present to receive. All sponsor locations have the right to refuse service to any person, not of age(21) or who they believe should not be imbibing further. 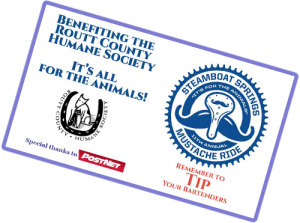 Routt County Humane Society and the Organizers of the Mustache Ride do not directly provide sponsor gifts. If you are refused service by a sponsor, there is nothing RCHS or the Organizers can do for you. Drink Responsibly!